I recently wrote about the disappointing NutriBullet infomercial. Although the product is the latest in the Magic Bullet line, the NutriBullet has abandoned the colorful characters and scripted scenarios of the earlier infomercials in favor of a dull and prosaic product demo. Reader Thomas left a comment with his own ideas for a NutriBullet infomercial, which involve Mick and Mimi visiting their friends Hazel and Berman in the hospital–and giving them an impromptu demonstration of the NutriBullet. Clearly, this would have been superior to the NutriBullet infomercial currently being aired! 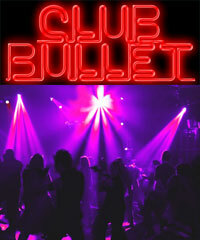 The neon sign outside a nightclub reads, “Club Bullet.” Inside, the crowd on the dance floor gyrates to the thumping sounds of club music while bathed in the glow of multicolored strobe lights. Behind the bar stand MICK and MIMI. Disheveled, BERMAN takes a seat and wipes his brow. Man, I’m sweating like a pig and I just got here. Maybe I can offer you something to cool you down. Smoking and coughing, HAZEL approaches the bar. I’m all out of breath. I guess my doc wasn’t kiddin’ about my heart condition. Hazel resumes coughing as TINA approaches the bar. Hi, sis. I assume you’re here for a cocktail. No, my doctor told me to avoid alcohol while I’m on antibiotics. That’s the worst thing about gettin’ the clap. Not to mention that some guy you’ve been tryin’ to forget phones you up to tell you about the “Valentine’s present” he gave you. Berman lowers his head sheepishly. I think the hard partying lifestyle has really caught up with all of you. The junk food [close up on Berman], the tobacco use [close up on Hazel], the bed hopping [close up on Tina] and of course our favorite…’frozen drinks’…have really taken a toll on your health. If you’re going to get back into shape, you need to get a lot more nutrition from your diet. How in the world can we do that, genius? It’s the NutriBullet, the world’s first nutrition extractor! 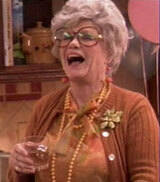 GRANDMA (from the Baby Bullet infomercial) arrives with a glass of Scotch in one handand a baby in the other. Grandma begins laughing hysterically at her own quip and sets the baby down on the bar. Is that some kind of a blender or juicer? The NutriBullet is so much more than a blender or juicer. It designed to break down the cell walls of your foods to release the nutrients inside and transform ordinary foods into superfoods. It must really be late, because I have no idea what any of that is supposed to mean. Rather than explain it to you, why don’t we just show you. Mick and Mimi do a demo comparing the NutriBullet with an ordinary blender. Mimi then pours out the contents of the blender, which is a pulpy green mush. That looks like what came out of my great-granddaughter this morning. Or what shot out of me last night. But what comes out of the NutriBullet is completely smooth. It’s not juice and it’s not a smoothie. It’s a NutriBlast. Here, have a taste. Mick pours a glass and gives it to Berman. This particular NutriBlast is great for controlling mood swings, acne, fatigue, and hormone deficiency. Hormone deficiency? He’s gonna need a bigger glass, believe me. Mick hands a glass to Grandma. Where’s the face on this thing? A young guy wearing skinny jeans, shades, and an Ed Hardy shirt walks up beside Tina. Hey, my friend, can I interest you in a NutriBlast? Name’s Bamm-Bamm. NutriBlast? That sounds wicked! Bamm-Bamm holds up the glass and eyes it suspiciously. On second thought, no thanks. Tina, I’m heading to the bathroom to freshen up. Bamm-Bamm places finger to nose and sniffs before walking off. You better pay attention to this next recipe, Tina. I think Bamm-Bamm may need it later tonight. Good for you! Get the young ones while you still can. You’ll appreciate it when all you can get is some guy who lasts 30 seconds before falling into a diabetic coma. As Mick and Mimi proceed with the demo of their next NutriBullet recipe, Sherman (from the Party Bullet infomercial) arrives and starts quietly flirting with Grandma. The two walk off, leaving the baby on the bar. So this is how that “overnighter at Grandma’s” turned out! Oh gross, I love it! “Where’s the face on this thing?” Hahahaha, that is SO much better. What a shame. Maybe they figure that people who want good nutrition don’t have a sense of humor, but I don’t see why the rest of us have to suffer watching another joyless humdrum ad. This is so awesome. Someone get Paul Lucas a job at Homeland Housewares, pronto! Hahahahahahaha HAHAHAHAHAHA! I wanna see this made. Yes its all like slutty Tina to go from Fred to Dino to Bamm Bamm… who’s next? Mr Slate? Actually, it should be a sitcom, so we can see the disfunctional gang every week. Every Bullet its own episode, all ending with Berman’s funeral, and the weeping widow Hazel chainsmoking her way through.